Buy with confidence! All items are considered to be EUC any known defects will be noted in pics and or item description. Measurements are included in the item pictures and are approximate We don't accept returns for fit style,color or buyers remorse. We will accept return if we have made an error (wrong size listed or major error not disclosed). We combine shipping on auctions won within a 7 day period. Please send us a message when you have won your item and we will invoice you. International orders/global shipping do not qualify for combined shipping. Our goal is to provide you with an excellent product at an excellent price! THANK YOU for shopping with us and don't forget to follow us and leave feedback! Snake Skin Print Heels Sandals. Style: Heels Sandals. Materials: Snake Leather. Color: Yellow. LEATHER UPPER and RUBBER SOLE. SIZE: US 7.5 M. (Excluding weekends.). Authenticity: All of our products are 100% authentic. CONDITION: GOOD. 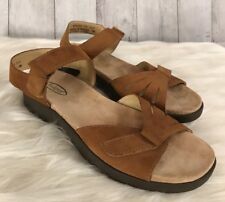 Very good condition Ecco Strappy Slingback Brown Leather Sandals. This is evident in these beautiful sandals. Material:PU Leather. The adaption of high quality, soft, and breathable material as the insole enables you to enjoy the comfortable wearing of the shoes. Wom a n's Shoes Size. Due to the difference between different monitors, the picture may not reflect the actual color of the item. 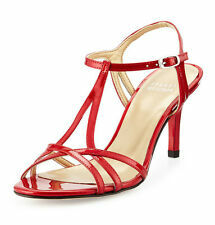 Stuart Weitzman Classic Red Quasar Yvette 1497 Strappy Patent Heeled Sandals Size 8 B. "Yvette" is made in Italy. 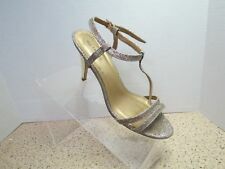 Stuart Weitzman strappy patent leather sandal. Item# 1497. Strappy crisscross vamp. Almond-toe cage sandals with slingback and hook and loop closure. 3" heel, 1" platform height. "Yvette" is made in Italy. Stuart Weitzman strappy patent leather sandal. Item# 1417. Strappy crisscross vamp. Naturalizer flats look amazing with your cute dresses and leather wedges. Dress & Formal. Strap Type: Ankle Strap. Style: Ankle Strap. Fashion Sneakers. Toe Style: Open Toe. Closure Type: Hook and Loop. Heeled Shoes. Silver Glitter. Ankle Strap. Call It Spring. Badgley Mischka shoes are the perfect evening shoes for any woman that wants to feel and look like a princess. Badgley Mischka shoes are perfect for the bride-to-be, bridesmaids, the mother of the bride and any woman who wants to feel glamorous on any given night out in the city, at her wedding, prom or to wear for a special occasion.